Home / News and Events / Black Student Convocation Is Here! Black Student Convocation Is Here! The second annual Black Student Convocation is just around the corner—happening on Saturday, Feb. 16, from 8:30 a.m. to 1 p.m. at Hagerty Lounge in De La Salle Hall. As part of the 44 Days Honoring Black History celebration, the Black Student Convocation is designed to give Black students an opportunity to gather, reinforce their academic and professional pursuits, enhance transformative bonds that support recruitment and retention, and discuss their shared experiences, goals, and needs as students at SMC with the guidance and support of Black faculty, staff, and alumni. The Black Student Convocation will also celebrate the successes of the Black community at SMC, provide a check-in on issues like Black student retention and Black faculty recruitment, and reaffirm Saint Mary’s commitment to building a more inclusive college. “This year’s convocation is about strengthening the community within the varied layers of the institution by bringing together alumni, faculty, staff, and students so we can understand the power we have as a collective,” said Desirée Anderson, director, Intercultural Center. “As the theme for the overall 44 days suggests, there is strength in community, but the Black community is so spread out, and this event attempts to bring this network of people together to build on relationships and the individual skills we all possess to highlight to our current students that they have a whole community behind them willing to hold them as they cross one of many finish lines,” she added. The slate of activities will kick off with a Black Convocation Breakfast with President James Donahue followed by remarks from Black student leaders; a career panel discussion with invitees from Google, Wikimedia Foundation, Girls Inc., #cut50, and Hamilton Families; and breakout sessions on self-advocacy and professional development, and financial literacy. The afternoon will culminate with the always-fun painting of the SMC. 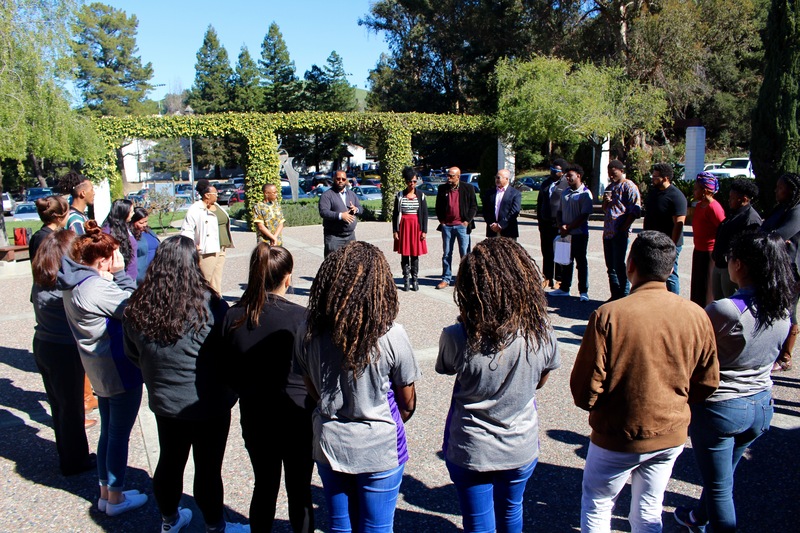 The event is organized by the Black Lives Matter and 44 Days Honoring Black History committees, which are part of SMC’s College Committee on Inclusive Excellence.